Listen up, writers, we have a competition running! 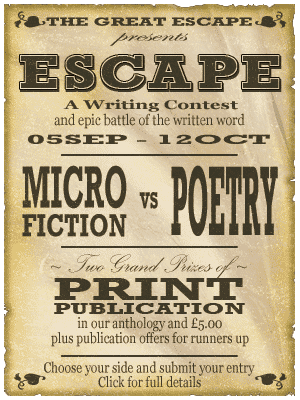 Are you team Micro Fiction or team Poetry? Join in the battle of the short form literature by entering your work into our competition. The team with the most entries will be declared the winner. Your theme is “Escape”, what you do with it is up to you. We’re looking for originality, creativity and powerful expression in a short space. Find out more about the terms, prizes and how to enter on our Competitions Page.